Ten years ago, photos of the crucifixion — and worse — were released to the American public. 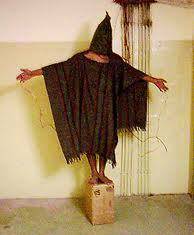 The media still call it “the Abu Ghraib scandal,” as though, oops, the awkward repercussions for Team Bush were the torture photos’ primary horror. No one talks about “the Auschwitz scandal.” The depth of our moral wrong has yet to be plumbed. Ten years later . . . the hooded man with arms outstretched, electrodes attached to his fingers, revisits the national conscience. Iraq is in a shambles. The prison itself was closed in mid-April because Sunni insurgents are too much of a threat in the region. We wrecked and contaminated two countries in reckless pursuit of revenge and national interest. Two years ago today, the president of my country, Manuel Zelaya, was forced at gunpoint onto a plane in an SOA graduate-led coup. As Zelaya flew away, the integrity of Honduran sovereignty and democracy disappeared with him, but left behind on the ground was the resolve of my people to struggle to get it back. This determination quickly exploded into what is now the Popular Resistance Front of Honduras. Until that morning two years ago, I had never taken part in a demonstration on the street. All that changed on the morning of June 28th as I joined together with people I had never known – members of the LGBT community, Afro-Hondurans, indigenous leaders, and campesinos – to recover our stolen democracy. 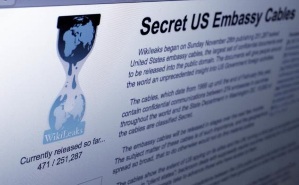 WikiLeaks, the whistle-blower website that has published thousands of classified diplomatic cables, has posted two cables from the U.S. embassy in Costa Rica, that offer insight into the U.S. pressure tactics to keep the SOA/ WHINSEC in business. When we join together as small grassroots groups from around the Americas to resist militarization and promote a culture of peace we are, quite simply, very powerful. So much so, that the world’s largest military giant not only takes notice, but sometimes has to scramble to keep up as we take the lead. Just days ago, Wikileaks revealed cables from the US embassy in Costa Rica that unveil an all-out six-month campaign by the embassy, in conjunction with the Pentagon’s Southcom and SOA/WHINSEC to subvert one of SOA Watch’s major strategies: the appeal to governments to withdraw their troops and police from SOA/WHINSEC.